ROM for the Holidays and WIN a ROM Family Membership | Kids in T.O. In a galaxy far, far away. Well, not so far – the corner of University and Bloor, or if you’re taking a red rocket, Museum Stop. For those planning to land at the Royal Ontario Museum over the holidays, you will discover some ‘out of this world’ options to keep the kids busy. 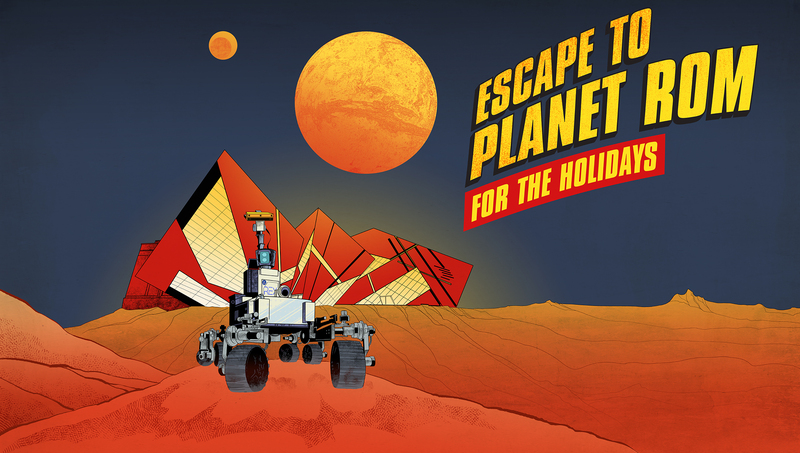 From December 26 to January 3, the ROM has gathered a long list of space-themed adventures. For starters, you can meet Rex (and not just the big T-Rex.) This Rex, from the Canadian Space Agency, is a Canadian-built Mars rover prototype. Kids can also get up close to a real lunar meteorite and a piece of Mars, check out spacewalking gloves that were actually in space and play video games in the Space Arcade. There are also puppet shows, a pop-up planetarium, roaming circus performers, ice sculptures, balloon art, craft stations and cookie-making. The list goes on with live reptile shows, a citizen-science bird count project and the last chance to see Pompeii before it closes on January 3, 2016. What’s got us even more excited is that we are giving away one (1) Family Membership. Low-down: The extra programming (between 11 a.m. and 4 p.m.) is free with admission. There is discounted admission after 4:30 p.m. during days with extended hours til 8:30 p.m. Be sure to check out the schedule, as some activities are available on certain days and times.